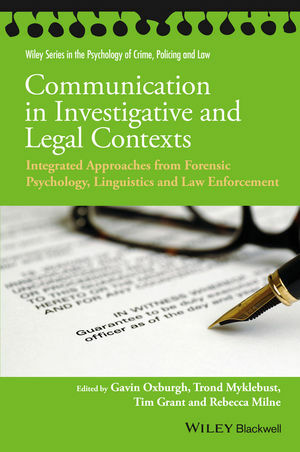 Communication in Forensic Contexts provides in-depth coverage of the complex area of communication in forensic situations. Drawing on expertise from forensic psychology, linguistics and law enforcement worldwide, the text bridges the gap between these fields in a definitive guide to best practice. Dr Gavin Oxburgh is a Forensic and Chartered Psychologist, a Chartered Scientist, and a Senior Lecturer in Psychology at Newcastle University, UK. He is the Chair and founding director of the International Investigative Interviewing Research Group (iIIRG; www.iiirg.org). He previously served with the Royal Air Force Police, specialising in the investigation of sexual offences. He has recently developed training for investigators from the International Criminal Court, the United Nations High Commissioner for Refugees, and the United Nations Development Programme. Dr Trond Myklebust is Assistant Chief of Police with the Norwegian Police University College (NPUC), a public university conducting research in areas such as psychology, police science and law. He has a background in police work, theoretical and practical experience in forensic psychology, and has specialised in investigation and forensic psychology in Norway and internationally. He is a member of the INTERPOL Specialist Group on Crimes against Children, and Deputy Director/co-founder of the iIIRG. Dr Tim Grant is a Professor of Forensic Linguistics and Director of the Centre for Forensic Linguistics in the School of Languages and Social Sciences, Aston University, UK. He has qualifications in both linguistics and psychology and is particularly interested in the interaction between forensic linguistics and forensic psychology. His main research interests are in forensic authorship analysis and the conversations, which occur between attackers and victims in cases of serious sexual assault. Dr Becky Milne is Reader in Forensic Psychology in the Institute of Criminal Justice Studies, University of Portsmouth, UK. She leads the distance learning degrees for investigators and police officers and, in 2010, opened the Centre of Forensic Interviewing. She is an Associate Editor of the Journal of Investigative Psychology and Offender Profiling, and the British Journal of Forensic Practice. Becky works closely with police and criminal justice organisations, and is the author/editor of several books.